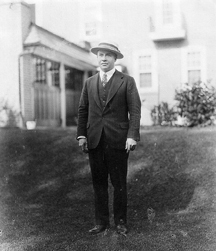 The farm was purchased in 1920 by Herbert Watford, a Toronto businessman originally from Woodstock, Ontario, with a passion for agriculture. 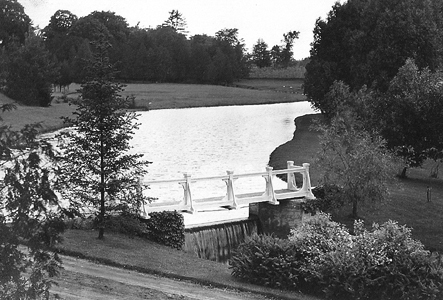 Herbert and his wife Mabel (Peppiatt) moved to the farm in 1923, along with Herbert’s father Absilon Johnston Watford. Herbert and Mabel were second-generation Canadians both of whose families originated in England. The moonlit reflection on the river running through the front of the property gave the business its name, Silver Stream Farms. The river is a branch of the well-known Rouge River in York Region and at the time was filled with trout and other species no longer found in the river system. Like all agriculture in the 1920s, the farm was generally mixed, producing a variety of livestock and field crops as well as specialty crops such as asparagus, strawberries and apples, delivered direct to Toronto markets. 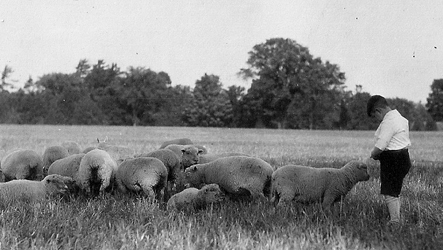 More typical farm products included wheat, oats, and barley (no corn or soybeans at this time in agriculture), milk, beef, pork, eggs and the finest lamb in Canada. Silver Stream Farms raised some of the best livestock in North America, competing for and producing champions at The Royal Agricultural Winter Fair in cattle, sheep and wool for decades. Currently, three generations of Watfords have shown livestock at The Royal. The farm continued to produce a variety of products and crops through the next generation and was always on the cutting-edge of agricultural technology both in field crops and livestock. Major changes through the early- and mid-1900s saw the replacement of horse-drawn implements with the first tractors and more efficient livestock systems. Herbert’s son Raymond was one of the first people in Canada to employ new cage laying systems and poultry genetics to egg production, leading Canada into a more modern, mechanized agriculture capable of producing for a growing population. At one point, Silver Stream Farms was delivering a million eggs per year to Ontario consumers. Along with delivering eggs, apples, strawberries, pork, lamb and other products to Toronto markets, much was also sold direct to the public at the farm gate. Raymond and his wife Marilyn (Montgomery), with their farm-retail experience, became the first apple growers in Canada to try pick-your-own in the late 1960s, despite being warned that “city people” would destroy their fruit trees. It has since become the mainstay of much of North American farming. Raymond’s children took over farming operations in the 1980s taking the farm in a more public direction. With an emphasis on fruits and vegetables, crops were grown both for pick-your-own and direct sales and the first Farm Market was opened at the farm. The market featured home-grown produce and fresh baking in addition to produce from local farms and gardens. Applying entertainment and education, Silver Stream Farms became well-known throughout southern Ontario. Crops included strawberries, raspberries, peas, sweet corn, apples and pumpkins and school tours were provided through several of these seasons. Every year culminated in a Halloween festival featuring haunted barns and special wagon rides and seasonal attractions. As population pressure began to hinder farming operations in Richmond Hill, a second market was opened in 1997 in Port Sandfield, Muskoka. While being more of a general grocery store, this was one of the first markets in the Muskoka area to focus on farm fresh produce and locally grown products – something that’s finally gaining in popularity in most regions.